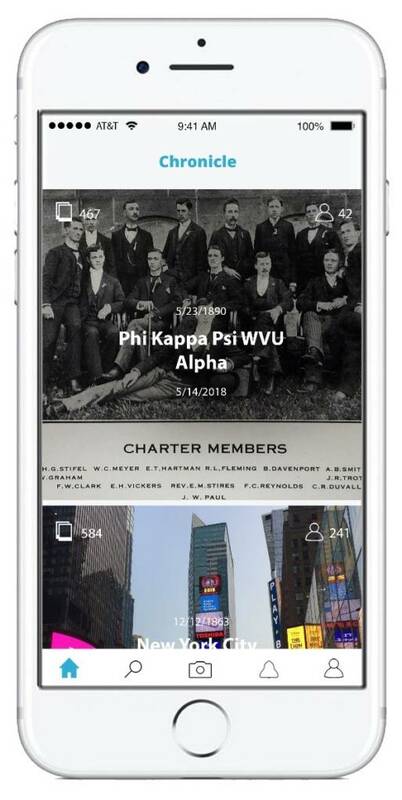 West Virginia Alpha’s Chronicle within the mobile app. Our West Virginia Alpha chronicle began with me digging through decades of photos in our basement and in old albums created by former chapter historians and scanning them onto the site. However, there is only so much I can interpret from photos that were taken 40 years before I was born. More often than not, I cannot tell who is in the photo, and sometimes, I’m unable to see what is happening in the photo. That’s what makes Chronicle so useful. 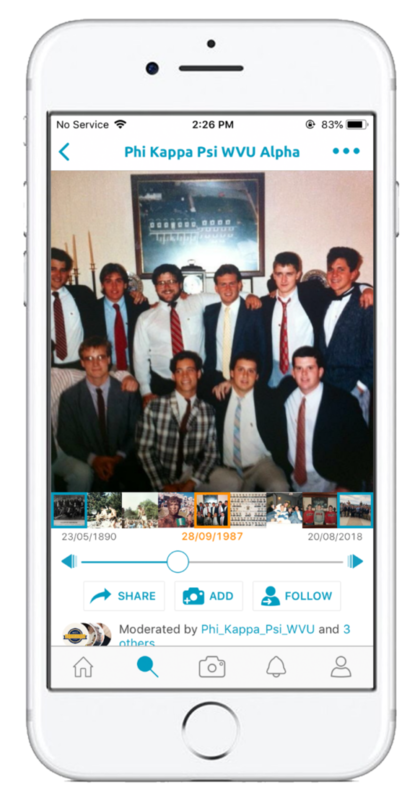 Often, an alumnus who sees the picture will comment and shed some light on important details such as the date, brothers photographed, or information about the event in the picture. Alumni not only help the cause by commenting on the pictures that I post, but they can directly contribute to our chronicle by posting pictures of their own. Brothers from the 70s, 80, 90s and today are sharing their unique part of our collective story at West Virginia Alpha Phi Kappa Psi, all while the chapter’s story is preserved and continually growing stronger. The West Virginia Alpha chronicle is invaluable to alumni who find themselves distant from the chapter they call home. Available online or free in the app store, Chronicle engages brothers of all ages, regardless of geographic location. Additionally, it allows them to reminisce on memories they may have made that in some cases, occurred over half a century ago. Also, through Chronicle’s embeddable iFrame, we are able to seamlessly embed the entire story into our chapter’s website with little effort. In the seminal days of our initiative, brother McBride and I decided to create a monthly newsletter to update all brothers on the events of the active chapter and what historic photos were contributed in the past month. We were fortunate to have hundreds of brothers subscribe. Some subscribers were even initiated at end of World War II. While some of them are not necessarily technologically-savvy enough to post their own photos, they have been generous enough to call and share stories of the past. For those of us who are passionate about our brotherhood’s history, there is perhaps nothing quite as rewarding as providing brothers from the distant past with a platform to preserve, share and reminisce on some of their fondest memories that form the foundation of our chapter, our strong values, and bond. After speaking with some of them, I have also learned that there is perhaps nothing more fascinating than their stories. From old time customs to the new traditions we create, our chronicle provides an accessible medium to spread the history and heritage of our chapter at West Virginia University. As with most chapters, the history of West Virginia Alpha is stressed during the new member education process. As Chapter Historian, I have utilized our chronicle heavily during our new member program to fully immerse our brothers in the culture and history of our chapter from its founding in 1890, to its re-chartering in 2017 and now today. There is no better way to appreciate the tradition of the chapter than learning from the first-hand accounts of its brothers. Our chronicle has even been useful to the chapter during recruiting efforts, by displaying the built-in slide show feature on a TV during rush. This has given me the opportunity to field questions about Phi Kappa Psi’s history, traditions, and values during rush. It has truly been a valuable tool in ensuring we initiate brothers who respect the history and teachings of our brotherhood. Since brother McBride reached out to me with the idea of chronicling West Virginia Alpha’s history and ongoing story, the chapter and I have seen an exponential increase in knowledge and understanding of our own history. We have been able to re-engage alumni all over the country, and it has given them a medium to reconnect with the place they made lifelong memories and brothers. As Chapter Historian, this initiative has afforded me the opportunity to share my passion for our Fraternity’s history with a like-minded audience, and it has given me the ability to pass on a simple means for future Chapter Historians to record, document, and teach our chapter’s extensive history to future generations of West Virginia Alphans. To help or if you have questions about starting your own chapter’s chronicle, please contact me at LukeRobinson2365@gmail.com. 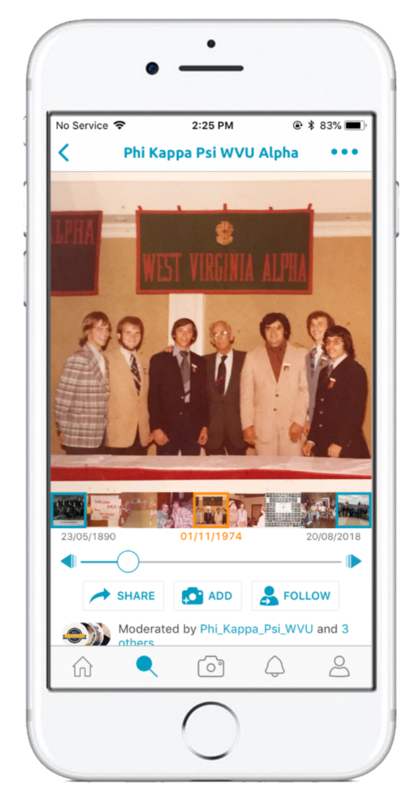 Pictured in the mobile app, WV Alpha made a strong showing at the 1974 GAC including SWGP, Harlan Selby.